Collaborative office furniture is a key emphasis for our clients. Collaborative office design and collaborative workspace enhances knowledge sharing and improves productivity and innovation. Companies look for opportunities to incorporate collaborative office furniture into the workplace environment. AFD creates environments that locate collaborative workspaces within work groups and delineates team spaces within an open collaborative floor plan using collaborative office furniture solutions. Additionally, we provide multiple types of collaborative office design settings such as lounges, large meeting rooms and small project rooms to allow the activity to dictate the choice of space. Collaborative learning often occurs through non-verbal communication and accidental interaction. While we all need private space to sort out our thoughts, we also need larger collaborative workspace in the organization to interact with coworkers. 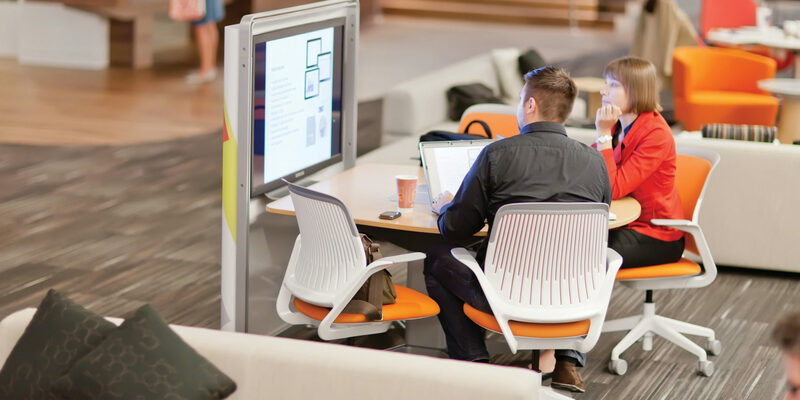 Collaborative office furniture in the workplace continues to increase in importance. Shared Planning offers table and desktop solutions for both planned and spontaneous collaborative office design. Shared desktops support multiple people who work together frequently. A collaborative floor plan can also be created with adjacent desktops and an extension for guests.